Cat Behaviorist Pam Johnson-Bennett is one of the foremost authorities on all things cat. She counts among her accomplishments being the best-selling author of 10 books, star of the Psycho Kitty series on Animal Planet UK, in addition to mentoring others in the field. Her article from her website, Cat Behavior Associates, offers some great insight into kitty’s behavior around the house, like knocking things off the table. You’ve seen it on countless videos and most likely witnessed it many times with your own cat. If a cat is on an elevated surface and there are small objects on there as well, he often can’t resist the urge to use his paw to push something over the edge. When a cat has captured prey, he often uses his paw to test if there’s any movement. If unsure of an object, he may also paw for exploration to check for any movement. You may often see this with your cat if he comes across something on the floor, such as a piece of food, an insect that isn’t moving or any other small object. It’s safest for him to explore the object with this paw before putting his face close to it. A cat may also use his paw to test the water level in his water bowl. This is especially common if the water bowl is too deep and would squish his whiskers if he tried to put in his face in to drink. He develops the technique of wetting his paw and then licking the water from it. There may be some objects on your nightstand or on a table that will roll if they fall to the ground. If the cat is looking for something to play with, he may test objects with his paws to see if they’re light enough to become an impromptu toy. With some objects, if they fall to the ground and roll on their side, that adds more enticement. It could even be the sound of a particular object hitting the floor that sparks play behavior in your cat. If the problem is that your cat is knocking things off your desk such as pens, paperclips or flash drives, keep in mind how irresistible these lightweight objects must be to a cat looking for some playtime stimulation. Boredom is probably a big factor when a cat knocks things over to engage in playtime. Cats are very smart. They engage in attention-seeking behavior and it’s repeated because it gets a response from the human family member. The classic example is the cat who knocks something off the nightstand and it wakes the cat parent. What does the cat parent often do? Get up and put some food in the bowl to quiet the cat. Bingo! Kitty quickly learned a successful technique. A cat may also knock things off tables at other times because it tends to get a response. Even if the cat parent yells at the cat or reacts in any way, it’s still a response. Even if you don’t mind that your cat engages in the behavior, it can pose a risk to him. Glass objects knocked over can shatter. Pill bottles that aren’t securely sealed can spill their contents when knocked to the floor. There are many objects on tables that if knocked over, can create a danger to the cat. Reduce temptation. 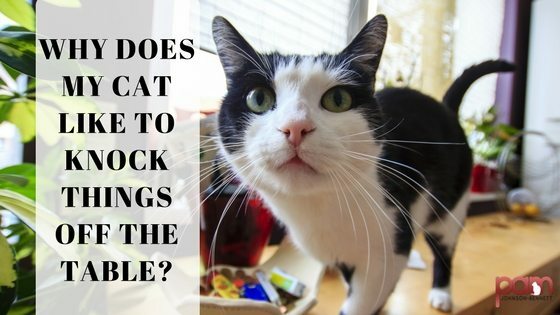 If you have a cat who tends to knock things over, then the first step is to make sure objects known to be enticing are kept out of reach or secured. Valuable or breakable objects meant for display can be secured using museum wax. Small objects such as pill bottles, jewelry, etc., should be placed in drawers or cabinets. If your cat likes to knock cups or water glasses over, use heavier, weighted cups to reduce the chance of movement. Provide safer alternatives. If boredom is the reason your cat knocks things over then it’s time to tweak the fun factor in your home. Keep him occupied with cat-friendly adventures such as playing with puzzle feeders. Whether you buy puzzle feeders or simply create some homemade ones, they’re a wonderful way to satisfy your cat’s desire to discover, play and then get a bonus reward for his efforts. Strategically place safe cat toys, such as furry mice, crinkle balls and whatever else your cat likes, all around the house for him to discover. If he likes batting objects to the floor, place a cat toy on the perch of his cat tree so he can knock that to the floor and then go chasing after it. Play with your cat. Even if you’ve set up the environment with solo activities for your cat, there’s nothing better than playtime with you. Use a fishing pole-type toy and engage your cat in at least two play sessions per day. When you do the playtime, move the toy like prey so he can satisfy his natural desire to seek, stalk, pounce and capture. Don’t reinforce unwanted behavior. If your cat is knocking things over to get your attention, don’t reward him with petting, food or even a reprimand. It’s also important though to figure out why he’s asking for attention so you can address the problem. Is it that he isn’t getting enough playtime? Are you inconsistent with the feeding schedule? Is he bored? Pam’s ground-breaking Think Like a Cat approach to cat behavior has been featured and profiled worldwide through the years. To the cat behavior professionals in the field today, Pam Johnson-Bennett has been a mentor and leader since she first paved the way in the early 1980s. Her book, Think Like a Cat, consistently remains the #1 best-selling cat training book on Amazon.